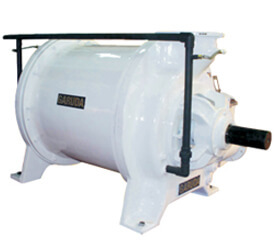 We, at GARUDA VACUUM PUMPS manufactures and exports an extensive assortment of water-ring vacuum pumps that are meant for numerous industrial applications. We are an ISO 9001:2000 certified company offers superior quality Liquid Ring Pumps, Water Ring Vacuum Compressors, Tri Disc Refiners, Twin Lobe Blowers,Vacuum Pump and Oil Seal Rotary High Vacuum Pumps in the market at competitive price. Our pumps are well-regarded in the domestic and international market due to their unmatched features & ultimate quality along with competitive pricing. To us, the trust and satisfaction of our client is our ulterior objective. Hence we stringently & consistently maintain the quality of pumps so that they exhibit high performance.There are many features as like High Reliability, High Performance, Easy maintenance, Negligible maintenance, Negligible maintenance and Compact. Water ring pump is a rotating displacement pump used as a vacuum pump and compressor. Using advanced machinery, latest technology and our vast experience we manufacturing products with high quality, high efficiency, robust design and maximum reliability as per customer’s requirements. Our products used for different vacuum applications such as filtration, precipitation, distillation in paper and pulp industry, pharmacy, chemical industry. The operating water can be also changed by other liquids. In spite of which liquid as the operating liquid, the pump are generally called liquid ring vacuum pump. The water ring vacuum pump can be used mainly and extensively. We export our pumps is regularly and repetitively imported by several nations across the world as like France, UK, Italy, Kenya, Algeria, United States, Mexico, Canada, Brazil, Colombia, and Argentina etc.